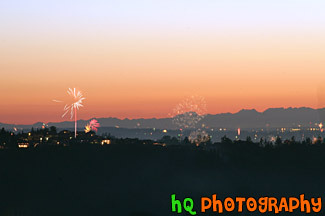 This is a scenic photo taken of fireworks going off all over the valley of Sumner/Puyallup located in Washington State. This photo was taken from Bonney Lake looking towards the Olympic Mountains as you can see the mountain's silhouette in the background. This photo was taken on the 4th of July during a beautful sunset.